Chilliwack Airshow , Chilliwack, British Columbia, Canada. One of a few Free airshows left in North America, Airshow 2015, NWCAS, ICAS, Fraser Valley, CYCW. five profiles were found for Chilliwackairshow.ca in social networks. Among other social networks the website is represented in Facebook, Twitter, GooglePlus and Pinterest. The web server used by Chilliwackairshow.ca is located near the city of Vancouver, Canada and is run by Telus Communications. 11 other websites are located on this web server. Most of them are provided in the english language. 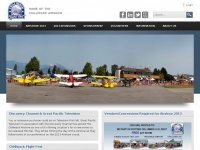 The websites of Chilliwackairshow.ca are hosted by a Apache server and were developed in the programming language PHP. The content management system WordPress in the version 4.7.5 is used. The HTML pages were created with the latest standard HTML 5. The visitor analysis software Google Analytics is used to analyze the visitors of the websites. Due to the robot information on the webpage, the following actions by webcrawlers are not allowed: using the description of the website from the Open Directory project. All other actions by webcrawlers are allowed.